Argentina's central bank governor Juan Carlos Fabrega has resigned after less than a year in office. He will be replaced by Alejandro Vanoli, who analysts say is more in tune with the economic policies of President Cristina Fernandez. Argentina is facing a raft of economic problems including high inflation at around 40% and a row with US creditors which has sparked a debt default. Shares earlier fell 8.2% amid fears the governor was poised to resign. Mr Fabrega had presided over an 18% devaluation of the peso in January this year. He had also spoken out against the government's heavy fiscal spending and advocated tougher measures to curb inflation. Mr Vanoli, who is set to replace him, is currently the head of the National Securities Commission, the regulatory agency for stocks and other securities. Argentina, which is Latin America's third-largest economy, is battling to avoid paying its bond creditors in full. A US court has ordered it to stop paying interest to those creditors who agreed to take a cut in the amount they were owed in order to receive at least some money back. Other creditors, two US hedge funds, took to court to force the country to pay them in full, something the country could not afford to do, as it is required by law to treat all its creditors equally. The central bank's reserves have fallen sharply, from $50bn in 2011 to $28bn. This week, Argentina deposited $161m (£99m) in bond interest payments with the state-controlled Nacion Fideicomisos bank, in an effort to skirt the US court rulings. The country had previously kept its funds with US-controlled Bank of New York Mellon. Also this week, a US judge ruled Argentina to be in "contempt of court". 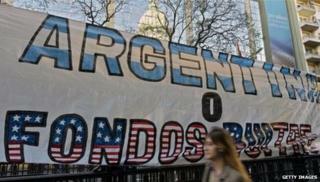 Argentina has been trying to repay the holders of its debt from when the country defaulted in 2001. The majority of those bond holders have agreed to lower payments as a result of Argentina's bankruptcy. However, two hedge funds - NML Capital and Aurelius Capital Management - have demanded full repayment of the $1.5bn (£920m) they are owed, and have sued to prevent the country from paying back only its restructured bonds.